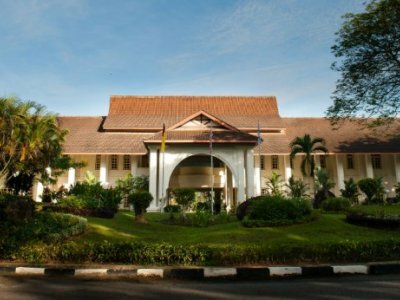 Kolej Tuanku Ja'afar (KTJ), is a co-educational international school in Negeri Sembilan, Malaysia, founded in 1991. Its Primary School is a day school for pupils between the ages of 4 and 11 while its Secondary School offers boarding for students from the age of 11 to 19. Day schooling is also possible in the Secondary School. It is a British curriculum school. The school is a member of the Federation of British International Schools in South East Asia (FOBISSEA), Association of International Malaysian Schools and the Council of International Schools. Good community, good students, reasonably excellent academics, on average very good teachers, good to mix not just with expat temporary students as students tend to stay here for the longer term. Teachers care about the school and students, and that shows. Many opportunities to get involved in activities. Communication with day student parents about events, scheduling can be terrible; inclusion of day students also need improvement. On the other hand, kids become quite independent and learn to organise their days. More time should be scheduled for serious subjects although I believe this does happen in higher forms. Personally, I think there are issues with almost all international schools. I feel this one is way better than most and has a sense of community and belonging that are not necessarily at the other schools. Academics is excellent in general. If you are after the typical expat international school experience, then this is not the school for you. If you want your kids to understand something about the local environment, have a wonderful learning experience, and mix with kids they may not ordinarily mix with, this school is good. Referrals from a friend. Do NOT send your child to this school. Check the rankings there are much better schools. Don't make your worst decision ever! Secluded environment surrounded by bushes filled with snakes and a few other animals and also mosquitoes. The school authorities also turn a blind eye to all this. Staff are rude and poorly trained. Avoid this school! Find another school from the top ranking schools. Don't send your child to this below average, rude and dangerous school.